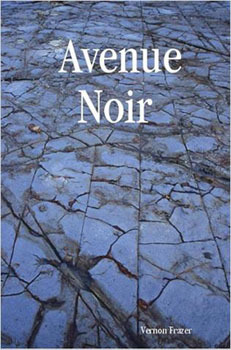 This is a review of Avenue Noir by Vernon Frazer. My name is Dan Waber, and I believe the future of Poetry is Visual Poetry. So, go ahead, put that big, fat grain of salt right smack dab in the middle of your soup plate and watch how it seasons the following stew of impressions. Let's start with a general description of the work to orient anyone unfamiliar with it. This is a 44-page book of text that was (I'll bet a soda pop on this one) hand set by the author in Microsoft Word, and makes extensive use of a broad range of the text decoration and placement effects the software can manage. Beyond that, I think it would be a waste of everyone's time to try and make labels like "novel" or "poetry" or "prose" or "narrative" or "experimental" try and stick. Twenty years from now someone will have a snappy name for it. We don't have one today, and, we don't really need to slow down the ride long enough to find one right this instant. Let's just dig in. Did I like it? Yes. Do I recommend you read it yourself? Yes. Did I love absolutely everything about it and predict the rest of this review will read like one of those book blurbs that makes you wonder how much the blurb-writer got paid? No. Let's go there first, to the burrs, to the disappointments, to the aspects of Avenue Noir that I wish were other than they are (because I liked it enough to want to love it—if only (if only)). After the nits have all been picked, I'll tell you what I liked about Avenue Noir, and why I think you need to read it (because I do think you need to read it, or I wouldn't be writing this (I really wouldn't)). When reading boring, old, regular prose and/or poetry the job of the typography is to clarify the experience as unobtrusively as possible. When you're involved in the business of reading, the typography has succeeded if you don't notice it at all. It's a visual art, not an algorithmic science. Do not let the (absurd) fact that typefaces are one of the only things left that can't be copyrighted in the USA convince you otherwise. This art has given us many visual conventions which can be creatively bent, and even broken, to great advantage if we care to do so. The price we pay (in readability) of disregarding them in regular writing is not less in typographically innovative work. The price is even higher. If any writer wants me to care about the subtlest details of their typographical innovation, that carries the responsibility to demonstrate that they care about the subtlest details of typographical convention. If I, as a reader, am going to be called upon to work hard at meaning-making (and may even be expected to fail at it, in places), I don't want to be gnawing my way through typos, too. If you want me to oh-hell-yeah a brilliant, meaning-multiplying creative spelling, don't make me flip a coin to determine whether it was intentional or not because I've identified too many obviously uncorrected misspellings. There are too many typos in Avenue Noir. and that doesn't get done by adding in spaces (which has the added drawback of creating a certain kind of recurring typo). Don't get me wrong, I'm a big fan of the visual block of text. I can even make the case that I'm one of its biggest fans. But if a text has to break "approximation" at "approxima-", "post-legendary" at "post-legen-", "participants" at "parti-", "memory" at "mem-", "subjectivity" at "subjec-", "matter" at "mat-", "illusory" at "illu-", all on the same page, a better solution to the problem of achieving the desired effect needs to be found. Heck, I'd rather see hyphenation abandoned altogether than see it forced on a text in a way that doesn't further an artistic goal. These are just two examples of something I find throughout the piece, a sense that the typographical explorations are more imposed upon the text, rather than a natural outgrowth of the demands of the text. This is a bias of my own, which I freely admit. I want there to be a reason for that rule to be broken, and I want that reason to be driven by the text. Add a grain of pepper to the stew. There are nits I could pick involving the visually disruptive limitations of Word, as opposed to a program better suited to what is more an exercise in graphic design than word processing, but I won't get into that, here, beyond noting that it is noticeable, and suggesting gently to anyone who'll listen that there are other, better, options. Yes, there's a larger learning curve. Yes, it's worth it. Yes, it's the future of poetry. The only other aspect of Avenue Noir that disappointed me was the voice presented in the more prose-like pages. Each flip of the dial back from the more poetry-like pages brings with it a change in character, but the language employed was such that none of the personalities were convincing to me; not as characters who would really use these phrasings, nor even as fully differentiated individuals. In the end, they were each clearly the author. Perhaps that was the intention, but, if it was, then I was completely fooled. In either case, the way the characters were realized was not completely satisfying. Now, enough with the nit picking already, I said I liked this book, and I mean to prove it. The written word has visual properties. Those properties can be leveraged for poetic ends. When the first human made the first visible word, she knew she'd never be alone again. Because immediately on her left appeared another human to tell her how she should have shaped the word, and on her right appeared yet another human to tell her how she could have shaped it. We can't help it. We love tinkering with the parts of language that are tinkerable. And we're really good at it, too. Pen and ink? Calligraphy. Typewriter? Concrete poetry. Word processing software? Avenue Noir and IMPROVISATIONS. It's the natural, and I say inevitable—even inexorable—progression. Get with the program or get left behind, people, this is your official finger pointing at the writing on the wall. The range of typographical experimentation present in Avenue Noir is, by itself, more than enough reason for any serious reader of contemporary writing to want to read it. You can't just sit there on your sofa with your laptop on your lap and nod and say "yeah, typographical experimentation, I dig it" and expect to benefit from the ground-breaking work Vernon Frazer has done here. You have to climb on into the text and really give it the attention I'm telling you it deserves. Here's my guarantee: if you read Avenue Noir for the first time and you don't come away with at least ten new things you want to try yourself, I'll personally write you an apology for leading you astray. I can't decide if I like or dislike the stretch of strict alternation of the pages (left hand as cascades of poetry-fireworks, right hand as justified prose-blocks), because it strikes me as a bit arbitrary, as more imposed upon than grown out of the text, but I definitely love the effect on semantic processing of the jump-cutting into and out of each mode. The visual shifts that occur with the voice shifts are highly effective and serve to augment the character shifts rather than confuse them. I often struggle with texts designed to subvert normal meaning-making paradigms, but I found that getting a good running start in the stretches of character-based prose-like narrative allowed me to plunge deeper into the sense-fragmentary poetry-like parts than I would normally be able to go. The ability to climb back out of the sense-fragmentary and back into some prose-like narrative also kept me from feeling like I was stuck in an endless drowning flail. The final section of Avenue Noir is also worth the price of admission alone. But don't skip to the end and read that part and think you got it. That's not going to work. What makes the final 9 pages sing is that they are an expertly orchestrated chorus of all the voices and tropes and notes and symbol crashes played out in isolation throughout the preceding pages. This is a virtuoso performance of interweaving that you do not want to miss, and if you're a serious student of where poetry is headed today, you can't afford to miss it.